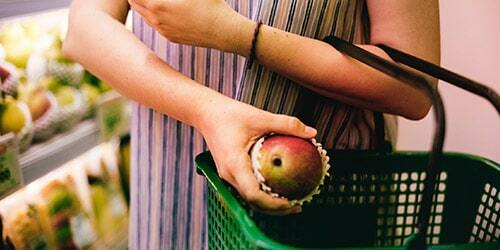 How would you like to eliminate grocery shopping from your weekly to-do list? No more pushing a cart around with a squeaky wheel or standing in mile-long checkout lines on a Sunday afternoon. It sounds like a dream, right? Well, with grocery delivery services like Shipt and Instacart, it’s actually a reality. Instead of trekking to the store on your own, you can have a personal grocery shopper pick up everything on your list without you ever needing to leave home. It takes all the hassle and stress out of grocery shopping. If you’re interested in grocery delivery and you’re looking into signing up for either Shipt or Instacart, we’re here to help you make the right decision. First, How Does Grocery Delivery Work? The great thing about grocery delivery is the convenience it provides. Instead of driving to the store, navigating packed aisles filled with other shoppers, and waiting in long checkout lines, you can have someone else handle that for you. At the same time, you could be working, spending time with your family, or doing more important things on your to-do list. You simply need to scroll through the aisles of the digital grocery store of your choice via the Shipt or Instacart app or desktop website. Just add everything you need to your virtual shopping cart and place the order. Then, your grocery shopper will take care of all the tedious stuff. They’ll pick up every item on your list, pack it up and, after they’ve checked out, the order will be on its way to your doorstep all without you having to leave the house. Shipt and Instacart allow you to stay in touch with your shopper via text so you can make adjustments to your order if needed and get live updates from the aisles of the grocery store. In fact, you can open the Instacart app and see what your shopper has already picked up, what’s still on the list, and which items are out of stock and need replacement items. This way, it’s just like you’re in the store with your shopper and you’ll be able to get everything you need. When it comes down to it, there aren’t a ton of big differences between Shipt and Instacart. They bother offer the exact same service. Where they differ in the grocery stores you can shop at, service availability, delivery speed, and pricing, so that’s what we’re really going to be focusing on in this comparison. Sometimes going to a physical grocery store can be a bit overwhelming. There’s so much to look at, if you don’t have a plan of what specific items you need to get, you can lose track of time wandering through the isles. On the flip side, the Shipt website makes “digital” grocery shopping easier to navigate. Up at the top you’ll have the ability to select your preferred grocery store. Then, you’ll have all of the options of that store on your screen. You’ll be able to navigate by category, see what you’ve purchased before, see what’s on sale, and even see what exclusive Shipt items are discounted. Of course, if you’re looking for a specific item, you can simply use the search bar. The Shipt website prioritizes savings. You’ll notice in the screenshot of the homepage above, there are specific links to “On Sale” and “Exclusive Savings” sections. 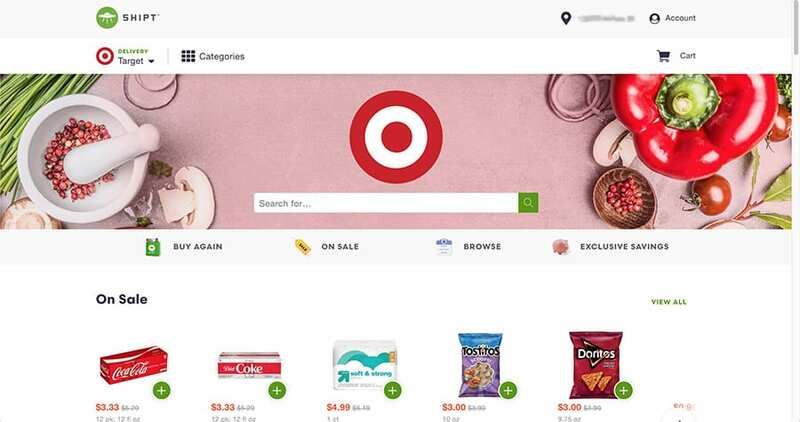 Under that, you’ll see the homepage has a list of on sale items. As you scroll, down the website there are even more ways to save with a “Featured Promotions” section. When you click on an actual item, you’ll be able to a close-up version of the product, pricing, and you’ll be able to write any specific instructions/notes you’d like the shopper to know when he picks it up. For example, if you add eggs to your cart, you can tell the shopper to double check the carton to make sure none of the eggs are cracked. Below the item and description of the item is a list of recommended items based on your browsing history. For example, if you’re looking at cheese dip, you may see recommendation for nacho chips. What makes the Shipt website nice for shopping is that when you click on a product, you never actually leave the category page you were on. It pops up as an overlay on the page you were on. This makes it easy to go back and forth adding items to your cart without having to constantly hit the back button. The Shipt app is available on both iOS and Android devices. It’s very similar to the website — basically just a condensed version. There are two reasons I would recommend downloading the app though. First, it allows you to stay in contact with the Shipt shopper through the Shipt chat screen while you’re on the go. If you don’t have the app, you can still opt to get text messages instead. Second, the Shipt app has a really handy barcode scanner feature. 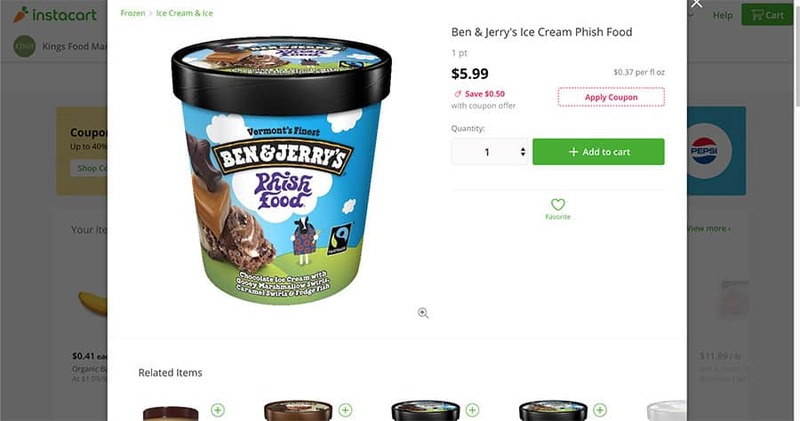 So, let’s say you don’t want to search to see if the grocery store on Shipt has the item you want to add to your bag. Instead, you can find the item in your home and scan the barcode to simply add it to your shopping cart (if it’s available). Viewing the Instacart website, you’ll notice it’s setup relatively the same way as Shipt. They don’t necessarily prioritize savings as much as Shipt. However, they do prioritize shipping time. You’ll notice that next to “Delivery to” they tell you when you can expect your delivery (within 1 hour). You can change this and schedule for any time of the day, if you’d like. The Instacart product page is similar to Ship too — it’s an overlay. However, they do not give you the ability to add instructions for the specific product you’re adding to your cart. They also do not include detailed descriptions on what the product is. However, they do sometimes offer coupons that can be applied to the product right before adding to your cart. 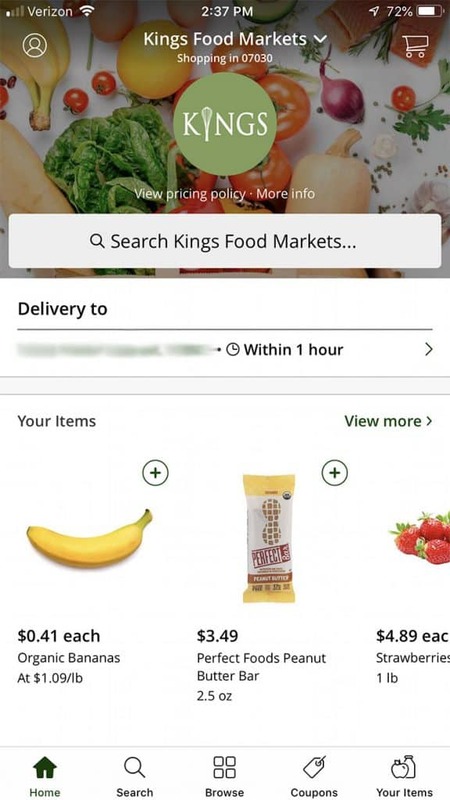 The Instacart app, like the Shipt app, is very much just a mobile version of the website. It’s nicer to use than the desktop version. when you’re on the go and need to get your groceries delivered. Just like the Shipt app, you can stay in contact with your shopper as he is picking up your groceries. 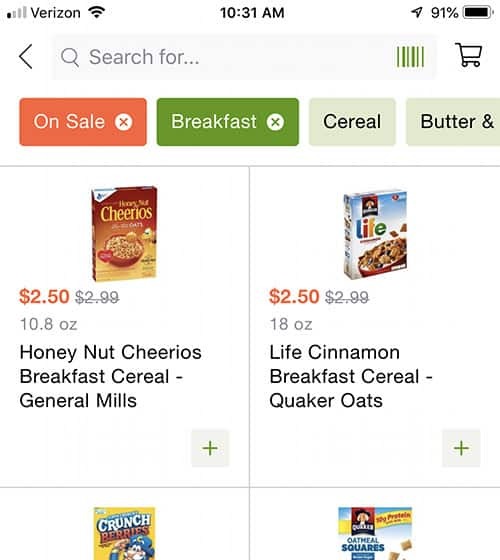 The only drawback in comparison to the Shipt app is the fact that Instacart does not give you the ability to scan barcodes to see item availability and add that item to your cart. Shipt and Instacart both position themselves as a way for grocery stores to easily take their products online. Essentially making them ecommerce stores. 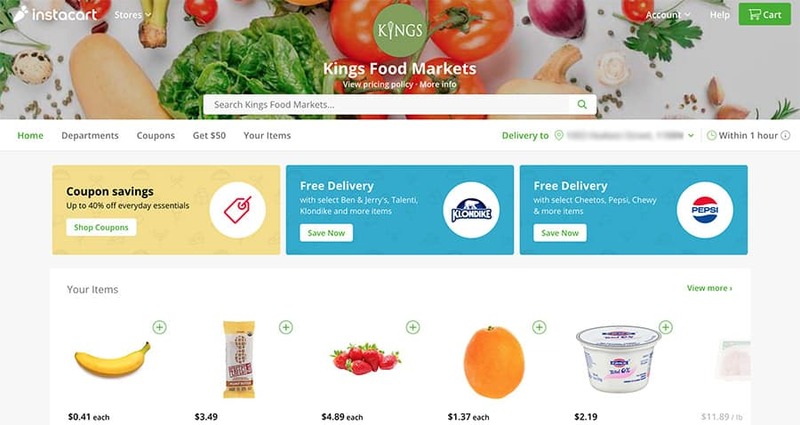 Both grocery delivery services allow any grocery store to sign-up and partner with them in order to expand to grocery delivery using their shoppers. Therefore, the list of grocery stores that each one offers varies in the stores offered. Shipt also gives you the ability to get delivery from pharmacies in your area, such as CVS. However, they cannot pick up your prescriptions. Like Shipt, you can also get delivery from pharmacies with Instacart. You can also get pet food delivery from places like Petco. When deciding which service to go with, the first thing you need to determine is whether or not it’s available in your area. Shipt and Instacart are not currently available in every location across the United States, so you need to make sure they can deliver to your home or business first. Shipt offers same day delivery to the states and cities listed on this page. Instacart offers same day delivery to many more states and cities than Shipt. Here’s a full list of all of the places they offer grocery delivery. Both Shipt and Instacart offer same day grocery delivery. You can schedule the day and time when you’d like your groceries to arrive at your home. However, Instacart’s main selling point is that you can get your groceries delivered in as little as 1 hour. That is incredibly quick, especially considering that the shopper has to drive to the store, pick everything up, checkout, and find your delivery address. With Shipt, you have two options for paying your membership. A yearly membership to Shipt will cost you $99 each year, while a monthly membership is $14 per month. If you anticipate that you’ll be using their service long-term, it’s definitely more cost effective to pay yearly (you’d end up saving $69). When it comes to the prices of grocery items, the cost you see when shopping on Shipt is actually what you’ll pay. You may notice that Shipt prices will vary a little from what you’d see in-store. To cover the costs of picking, packing, and processing your order, you will pay a little more. To give you an example from their website, if a loaf of Wonderbread costs $2.29 in the store, it would cost $2.59 to have it delivered to your door using Shipt. Instacart also charges $99 per year for their membership but does not have a monthly plan. However, if you’d like to use Instacart every once and a while, instead of subscribing to their membership, you can still order. For these “a la carte” orders you’ll be charged a 5% fee. The prices you see on Instacart are set by the retailer. In some cases, the price might be higher than in the store. Instacart is a bit vague on how they price specific products. Delivery on orders over $35 is free, while smaller orders will require a $3.99 delivery fee. You may pay additional fees for one-hour delivery depending on whether or not it’s busy. The busier they are for express (1 hour) delivery, the higher the delivery cost. It is recommended that you tip your shopper with each order you place, so you’ll want to keep this in mind before getting started. By providing the shopper with a tip, it shows a little extra appreciation for their time and effort. Shipt says you can tip any amount you want and you can do so within the app after you receive delivery or tip in cash once your delivery arrives. With Instacart, they suggest a 5% tip by default at checkout. There is a minimum suggestion of $2 per individual store delivery. Tips, of course, are optional and you can adjust the total tip at checkout or after receiving your grocery delivery. In fact, you can add or change a tip amount up to three days after the completion of your delivery. On thing to note about both services is that when you check out after ordering on their website, your credit card will be pre-authorized (not charged) for an amount higher than what you actually purchased. Why? This is because there may be instances where an item you want is not in stock and you request your shopper to pick up something that is more expensive. Once the shopper has delivered your groceries, the actual amount of the groceries you ordered (and were delivered) will be charged. As mentioned above, Shipt and Instacart have made it easy to stay in touch with your grocery shopper along the journey. If you need to make a change in your order, you can easily do that thanks to their apps and the ability to text the shopper. If replacements need to be made due to something being out of stock, your shopper will let you know. 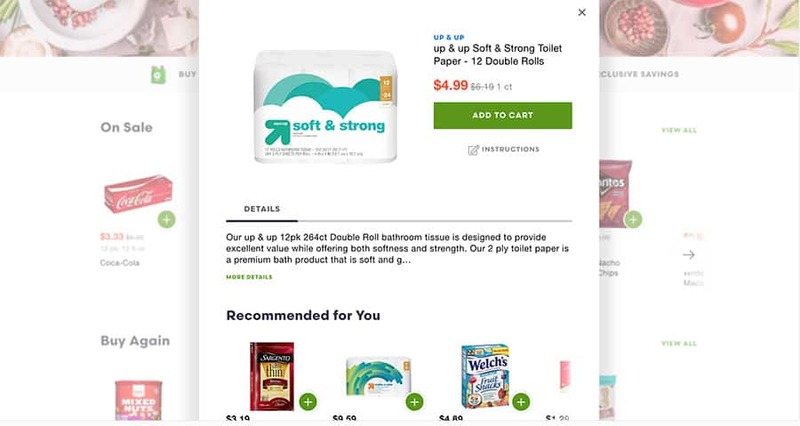 In both of our initial reviews of Shipt and Instacart, we had items that the shopper told us were out of stock so they let us know and we were able to give them alternative items to pick up instead. But what if you find your order is missing an item? Or what if something else has gotten mixed up? Well, there’s no need to panic because both Shipt and Instacart will help to resolve the situation. You simply need to contact them and let them know. You can contact Shipt by submitting a message via their website, hopping on a live chat with a representative, emailing them, or calling them on the phone. Instacart offers email and telephone support for customer service inquiries. Overall, both Shipt and Instacart offer pretty much the exact same service and there really aren’t too many differences between each one. You can count on either service to deliver your groceries without fail, allowing you to eliminate one more thing from your to-do list each week. It saves you the time and hassle of taking care of it yourself, which is definitely a plus! The number one thing you need to consider is which service is available in your area. If both of them are, then you’ll have some tough decisions to make! Look at how much you’ll have to pay for the membership and any additional fees, as well as the interface for the Shipt and Instacart apps. You might find that one is more user-friendly and appealing to you. After all, the goal here is to make getting your groceries as easy and stress-free as possible. You want to save money on specific items through their coupons and exclusive Shipt-only promotions. You want to use their special in-app barcode scanner to add items in your home to your cart. Shipt isn’t available in your neighborhood (Instacart serves many more cities). You want your groceries delivered as quickly as possible. You don’t want to pay for a membership and would rather just pay the extra 5% when you order occasionally.